The Cherry Blossom or "sakura" in Japanese is not very fragrant. However, the delicate beauty of it's pink or whte flowers leaves one wonderbound and you can only utter "SUBHANALLAH". Cherry blossom flowering period is pretty short. Our own Hunza has this wonderful tree. Japan is ofcourse the home. Recently I was on a vacation to Italy. While fully prepared for art masterpieces and architechtural treasures, I was least expecting to come across 'sakura'. however, I was lucky to see many specimens. 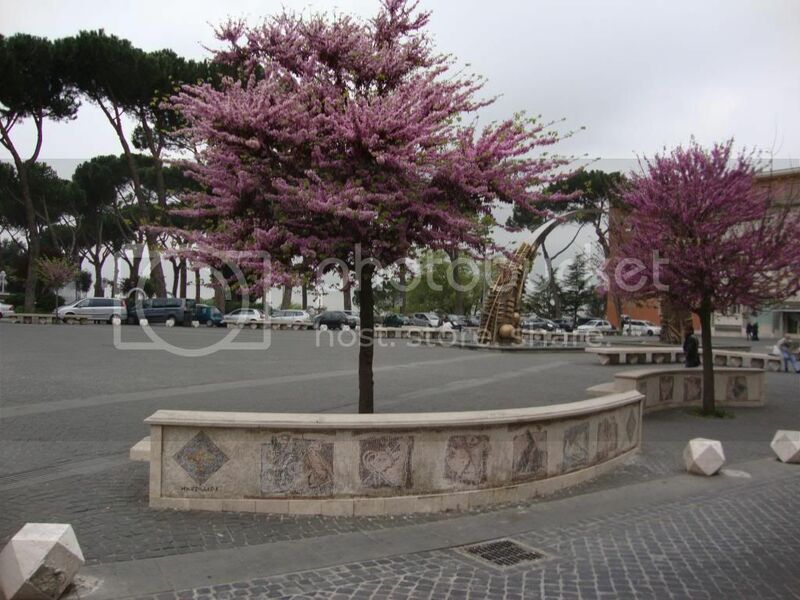 The attached photo is a street planted with cherry blossoms in Tivoli, a small town near Rome. Very beautiful indeed...every flower speaks of the Creator...Al-Musawar ...who else can be the best designer except Him? M Farooq wrote: Very beautiful indeed...every flower speaks of the Creator...Al-Musawar ...who else can be the best designer except Him? How right you are. These days I garden because it is one way of getting close to The Creator and witness His Beauty first hand. This is why I do not employ a "mali". I do my gardening hand ons except for trimming the "ficus pumila" which covers three entire walls of my house from top to bottom. Perhaps you have seen the photo of this creeper which I posted earlier in "What Is Blooming In Your Garden." A stunning display of fragrant lilies at a florist shop. 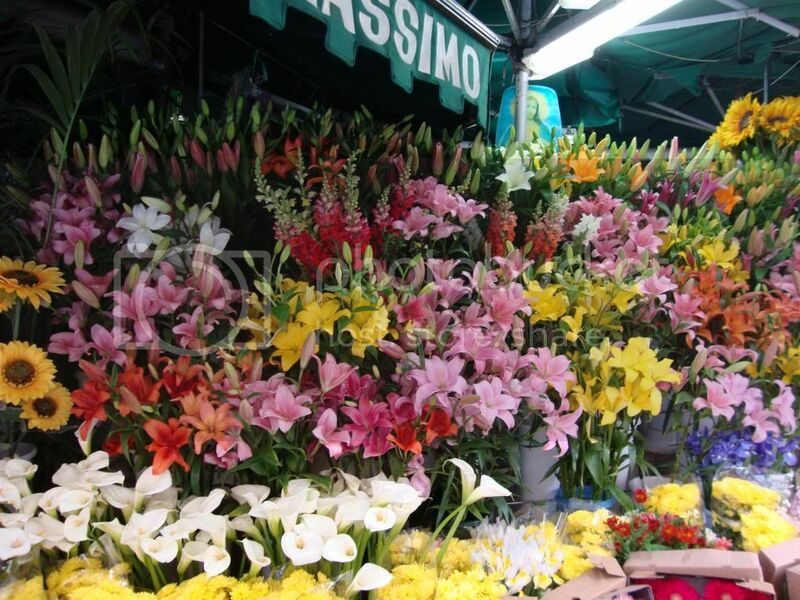 Hello1 wrote: A stunning display of fragrant lilies at a florist shop. Do you know any reliable recipe to keep the cut flowers fresh? I have been looking for an authentic recipe without much success. Asked florists but all they know is a sachet with mainly unknown contents (to them). I did see wall covering. It looks beautiful. I guess wall covering does not work for painted walls. If you are fond of collecting vines and lianas I would suggest a lovely vine called "wood rose" http://wildlifeofhawaii.com/flowers/900 ... -woodrose/. It will climb high and high and cover the area completely. Very rare in Karachi, but the wooden flowers look very beautiful. And I would love to know if someone has Pandanus odoratismus (Kev-ra). One flower is enough to make your lawn fragrant with a sweet oriental fragrance. You will be surprised to learn that the exterior walls of my house are painted with ICI Weathershield. This ficus pumila is a creeper which is extreely common in tropics. I have seen whole brideges covered by it in Singapore. Ficus is basically the fig family and "rubber plants" also belong to it. Checked out your link. This is a very pretty creeper and is a variety of morning glory. I have the common purple morning glory all around a trellis and full of flowers. I have a kevra plant. Had it for several years. However, unluckily, I have never seen it flower. Hello1 wrote: I have a kevra plant. Had it for several years. However, unluckily, I have never seen it flower. Well kevra flowers rarely, may once a year with 2 or 3 flowers. We had a mature "tree"... a ladder was need to chop the flower for gifting others etc. I am not sure why your kev-ra has not flowered and if it is the authentic kev-ra plant to begin with. The real kev-ra leaves are leathery dull green with plenty of propping roots. I have been sold "fake" kevras and they never bloomed. Secondly kevra has male and females flowers and exist as separate trees. Male one flowers and the female only bears fruits. When we used to live in the university, we had a huge kev-ra plant, the male one. It used to bear large yellow flowers. And that day used to be a treat as the whole lawn would be fragrant. It sheds tons of pollen if someone is allergic, he/she should not grow it. After more than ten years I have never been able to find kev-ra again...and those came after after us they got that pine chopped off. Could you post a picture please of your kev-ra, rather a close up of the leaves?